Suddenly, summer’s right around the bend, in the Northern Hemisphere at least. Less than a week till May and the kids are already itching to doff schoolwork along with their shoes. We’re staying up, and staying outside later into the evening, and I’m comparing schedules with colleagues regarding weeks we’ll be out of the office. If you work from home, and you have school-aged children, summer means your schedule’s about to be turned inside out like a wet swimsuit. And if you’re like me (i.e. the kind of person who’s grateful for Mondays), then you’re going into a minor panic right about now. OK, not outright panic, just some white knuckling when you think about keeping control of some semblance of a routine. 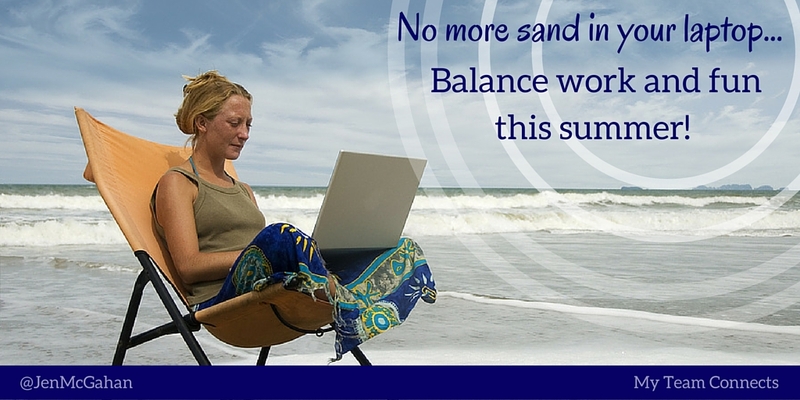 Managing summer fun when you work from home involves a mindset shift. First, accept this true fact: A lot of people ease up on the throttle in summer. Even super driven people let things slide more than any other time of year (except maybe the winter holidays). They are more forgiving of half days. They take long weekends. They understand when you have to take a call from a pool deck or a cabin. This relaxed vibe extends goes both ways. 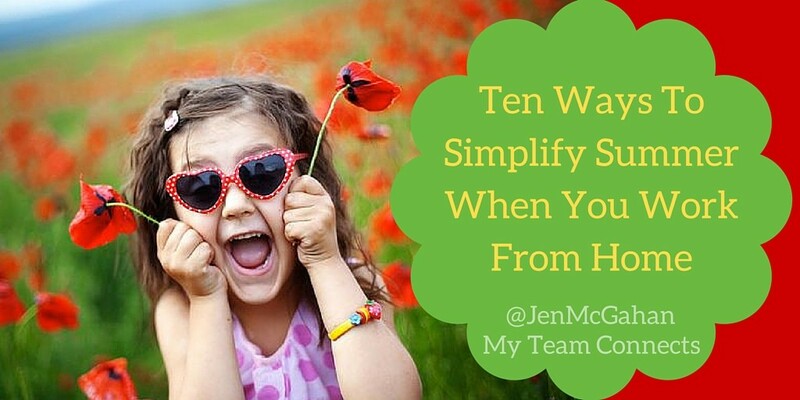 You’re probably more understanding of others’ weird schedules, too, and wiggle things around to accommodate. 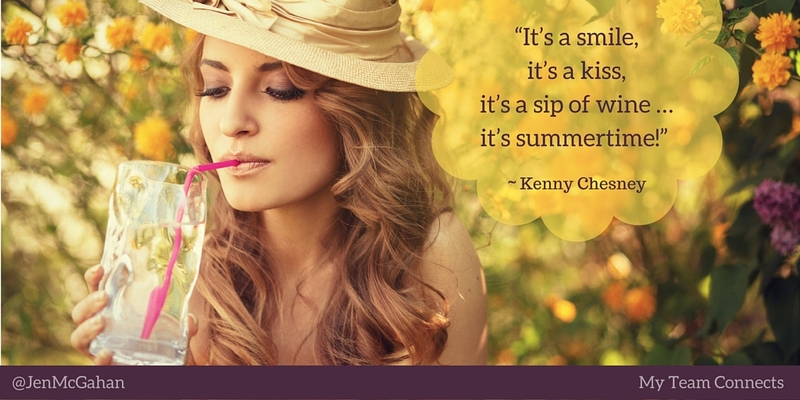 Summer brings graciousness and warmth. Maybe it’s because there are more hours in the day to get your work done, or so it seems when you work from home. Or it could be that the heat takes the edge off our more aggressive instincts. Things just seem to stretch more easily. Conflicts are more malleable, more resolve-able. “Island Time” mentality is permissible now, if during no other season. 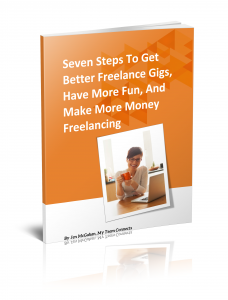 When I first started this work-at-home gig as a copywriter, I was writing sporadically for clients, taking jobs when I had extra time, not going after jobs when I wanted time off. I would go for days without hitting social media sites, marketing my services, or even writing a word. I don’t choose that anymore, mainly because my kids are teenagers now, able to schedule activities on their own — a huge turning point in mom-child relations. Beyond that, they don’t want to hang out with me much anyway. As a result of their growing up, and my stronger commitment to Content Boomer and My Team Connects, I don’t accidentally lose days to summer fun anymore. Instead, I plan them. Over the years, I learned to set goals, get organized, and manage my time if there was any hope of staying on target. Now, I plan days off to stay balanced and have fun! Yes, you can truly enjoy your summer, and still get stuff done. This is still true, even though I take less time off during summer than I used to. First, I realize that if I’m taking an impromptu vacation day, so are my customers and prospects. I need to expect that. Now that I work with a small team, and honor their flexibility, I account for their days off, too. It’s a bigger management issue these days, but oh, so worth it! Mostly, this means taking each day at a time, but being very clear about my daily priorities so that I can afford the time off — and keeping open communication channels between myself and others whose ideas, work, and input I rely on. 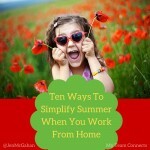 Here are a few ways to simplify summer when you work from home – and still enjoy the long, warm, easy days, too. On your email signature or automated out-of-office emails, note your upcoming days off, and when you plan to respond. If your emails are being forwarded, let people know to whom, if not you. 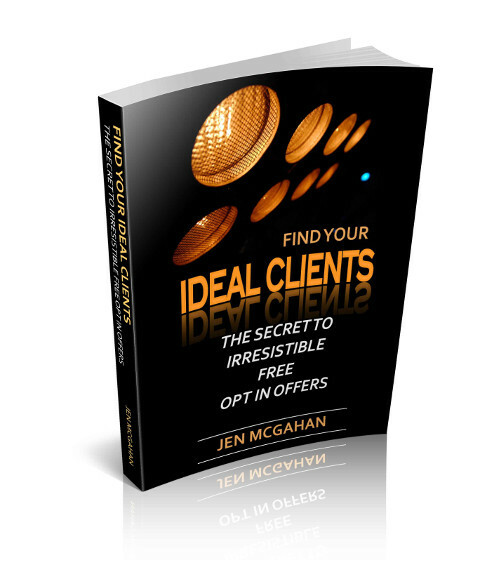 Offer alternative means of reaching you on the days when you’re “half on”, i.e. you’re working, but may be distracted by children’s activities, etc. Otherwise, drop out altogether, note your substitute or your return date, and let your contacts know when you’ll be back in the game and able to focus on business. Each night, make a short list. Write down the top five calls or tasks that you absolutely must accomplish the next day — and then get up early and get started. If necessary, make use of extra daylight for longer work days, especially when I know I’ll be taking a few hours off later in the week. Take advantage of your body’s natural Circadian rhythm and the extended daylight hours to get more done. At the beginning of summer set one or two specific, long-term goals you can attain by September. Write them down and post them where you’ll see them. Frame your summer’s day-to-day work around getting them finished. Use free time to concoct new mental treasures. Time spent relaxing or enjoying yourself is often the most conducive to creative thinking. Ideas for new projects or book chapters will flourish if you set the intention to ruminate on them as you play. Break down large projects and goals into small actionable tasks. Track daily and weekly milestones. Communicate with family members — especially your little ones — what you need to get done at your desk each day so that you both can enjoy recreation later. For example, when my child knows that we will go to the skate park as soon as I finish an article, he is more likely to give me the quiet time I need to finish quickly. If I simply say, “I’m busy,” or “I’m working today,” leaving it open-ended, I guarantee you the kids will be at my office door pestering me or fighting with each other all day long. By the way, this step is essential even with older family members and friends. If you’re planning a weekend at the lake with your family, for example, make sure everyone knows that you’ll be bringing your laptop and working for spells. That way, they’ll understand if you forego the afternoon antiquing, but join them later for dinner. Two words: Hotpockets and Popcicles. Make it easy for kids to grab their own food. If you can get them to eat something healthier, you’re a better mom than I. Mix work and play. For example, write your notes for an upcoming webinar while you’re waiting for a tee time to open up; agree to take a long weekend with your sister’s family as long as they agree to do the driving and you can work in the car on the way there. You get the picture. Your personality and work style will guide you toward a schedule that makes sense — but you must have the intention to plan and follow through. Otherwise you’ll accept invitations to goof off more frequently than you can afford; or keep your nose to the grindstone and feel like you’re missing all the fun. Neither is any good. Summer doesn’t have to mean that you won’t get any work done, close new business, or finish projects. It doesn’t have to mean you’ll drive yourself crazy juggling too much, either. Even though schedules are more relaxed and people don’t seem as driven as usual, remember that summer months are a time of rejuvenation and inspiration. Squeeze the best out of both work and play to simplify your summer, and you’ll be well rested for the fall.